Strange Bedfellows is a visual art exhibition exploring collaborative practice in queer art. Featuring the work of over twenty contemporary queer artists alongside ephemera loaned from the San Francisco GLBT Historical Society Archive, the show presents diverse strategies for collaboration and considers multiple authorship as a radical concept. 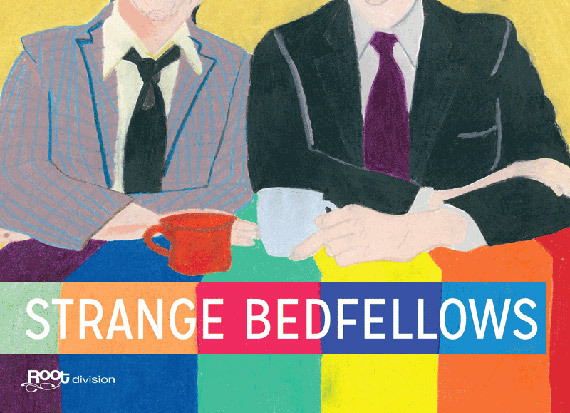 Strange Bedfellows is a nationally traveling exhibition with accompanying catalogue, and is a fiscally sponsored project of the Queer Cultural Center. The exhibition will debut in San Francisco at Root Division in June 2013 as part of the National Queer Arts Festival, and then travel to the Samek Art Gallery at Bucknell University in Lewisburg Pennsylvania in Fall of 2013. It will next be presented in Chicago for the College Art Association Conference in February of 2014 as the sponsored exhibition of the Queer Caucus for the Arts. [The exhibition is curated by Amy Cancelmo.] Additional funders for the project include Endeavor Foundation for the Arts & Rainbow Grocery. Bren Ahearn & Jesse M. Kahn, Jordan Arseneault & POSTER VIRUS, E.G. Crichton, Barbara McBane & Susan Working, Sean Fader, Alexander Hernandez’ with Rude House, Sarah Hirneisen, Amos Mac & Juliana Huxtable LaDosha, Tara Mateik, Billy ocallaghan, Adrienne Skye Roberts, Annie Sprinkle & Beth Stephens with Luke Wilson, Julie Sutherland*, Tina Takemoto & Angela Ellsworth, Chris Vargas & Greg Youmans, Angie Wilson & Amber Straus. Root Division is a visual arts non-profit located in the Mission District of San Francisco. Root Division’s mission is to improve appreciation and access to the visual arts by connecting personal inspiration and community participation. We provide subsidized studio space to working artists in exchange for their service in creating shared learning opportunities for the community. Artists develop creatively and professionally by teaching art to underserved youth, leading adult education classes, and producing exhibitions that showcase local emerging artwork. By combining multiple opportunities for creative exchange, Root Division cultivates an artistic ecosystem that enriches life throughout the Bay Area. Root Division is supported in part by grants from the The Andy Warhol Foundation for the Visual Arts, San Francisco Arts Commission: Cultural Equity Grants, Grants for the Arts: San Francisco Hotel Tax Fund, Phyliis C. Wattis Foundation, Crescent Porter Hale Foundation, Zellerbach Family Foundation, W A Gerbode Foundation, and Bill Graham Memorial Fund.